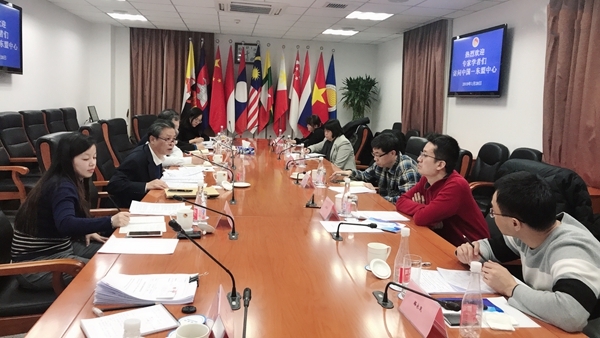 On 28 January 2019, ASEAN-China Centre (ACC) held a symposium with the theme of “ASEAN-China: connecting the connectivities”. Secretary-General Chen Dehai presided over the meeting. Mr. Zhai Kun, Professor of School of International Studies of Peking University, Mr. Guo Yanjun, Director of Institute of Asian Studies of China Foreign Affairs University, Mme. Jin Jiaman, Executive Director of Global Environmental Institute, Mr. Song Qingrun and Mr. Luo Yongkun, Associate Researchers of China Institutes of Contemporary International Relations (CICIR), Mme. Song Yinghui, Executive Chief of Unit of Regional Integration Studies of CICIR shared their observations on how to promote ASEAN-China cooperation on connecting the connectivities. ACC research and survey group members attended the symposium.